Nerdtour 2012 quickie: some tilt-shift fun – Nerdwatch! By Captain Nerd | March 21, 2013 - 3:48 am | March 31, 2013 artistic things!, dumb things!, Japan things!, nerdtour things!, photo things! I figured I’d try the “tilt-shift” action in the latest Adobe Photoshop Elements, modifying one of my Nerdtour photos. This is taken from a pedestrian bridge crossing the Kiyosumi Road, in the southern part of Monzennakacho, near the Etchujima JR station. This is a view looking down the road at Tsukishima, a man-made island built long ago in the middle of the Sumida River. Just a little fun with technology, I think it turned out okay! 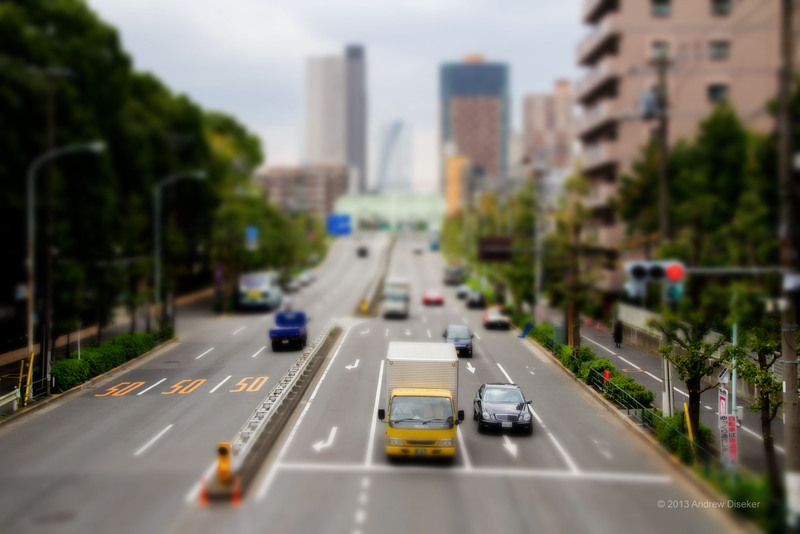 Tagged Etchujima, Kiyosumi Road, nerdtour, Nerdtour 2012, pedestrian bridge, Photoshop effect, tilt-shift, Tsukishima. Bookmark the permalink.